The Watchnight Service on Christmas Eve will also include a special offering for Aberlour, Scotland's Children's Charity and for the Kirkcaldy Branch of the Samaritans. Your support at Christmas Time for these local charities will be very much appreciated. Dunnikier Primary School is having its Christmas Service at St. Bryce Kirk on Wednesday 21st December at 10am. Kirkcaldy North Primary School is also having its service on the same day at 1.45pm in the school hall. Robin will be involved in both services and anyone wishing to attend either or both of these services should let Bob Docherty know. A Kirk Session photograph will be taken after the service on Sunday 18th December. On Sundays 11th and 18th December we would like to decorate the Church with Poinsettias. If you would like to purchase one in memory of a loved one or friend, please put your name and the person you wish to remember on the list in the vestibule. The names will be included in the Order of Service and the cost is £5. After the service on 18th December, please collect your plant to take home. The final date for purchase is 4th December. Any questions, please contact Senga Booth on 890972. The Flower List for 2012 is now available in the vestibule. If you wish to provide flowers for the Sanctuary, please add your name to the Sunday(s) of your choice. The Church will be decorated fot Christmas on Monday 28th November. Anyone wishing to help is asked to come along from 10am until lunchtime. The annual Christmas Gift Service will be held on Sunday 4th December when new unwrapped gifts for local distribution by The Salvation Army can be donated. After a short service on Thursday 10th November at Templehall Church (which is the collection point for the Kirkcaldy area) the boxes were loaded onto the lorry. Included in the number of boxes were 105 from Bennochy Church and 91 between the North and Dunnikier Schools. Thank you very much to everyone who filled a shoe box or gave a donation. This is an excellent result and, by filling a shoe box with simple gifts you can bring joy and laughter to someone this Christmas. Thank you for being part of it. The second Bennochy Parish Church Christmas Fayre was a great success with a wide selection of items for sale. Santa also helped out by ringing bells in the hall and meeting the children in his grotto. The fayre raised £2,521. Thank you very much to everyone who has filled a shoe box for the shoe box appeal. If you have forgotten to bring your filled shoe box to church today then please speak to Angela Stewart (268929) who can arrange to have it uplifted before Thursday. Our thanks go to the children of the North School and Dunnikier School who have also filled shoe boxes. There will be a short service (all welcome) for adults and children at Templehall Church on Thursday 10th November at 2 p.m., before the lorry laden with boxes from the Kirkcaldy area starts its journey overseas to bring joy and laughter to someone this Christmas. Thank you for being part of it. I hope they enjoy opening their shoe box as much as you did filling it!. Christian Aid totals for 2011 are £394.71 (Soup and sweet lunch), £3067.78 (door to door collection), £400 (Sponsored walk for East Africa Food Crisis Appeal) and £39.10 in donations making a total of £3901.59. This total is 14% down from 2010 due to the current economic climate. Special Offering in November for Poppyscotland raised £193.38. Many thanks from the recipients to all who contributed. The Walkers next walk is on 13th November leaving via car-share at 12.40pm. The first half of the walk rises steadily, though not steeply, just enough to get the heart rate up a bit. From the top you have a wonderful view stretching from Elie Bay to North Berwick. The Den itself is a beautiful walk especially in autumn, but you will need waterproof footwear as it is very muddy in parts. Refreshments at the Kennoway Burns are already booked for 3.15pm leaving just enough time to return to our cars before dusk. 4.6 miles. We will leave from the church at 12.40pm prompt. All are welcome. There will be a Songs of Praise Service on the morning of Sunday 20th November - your chance to choose your favourite hymn or song. Please contact George Drummond or the minister with your selections. The Hall will be open for the receipt of goods on Friday 11th November from 2 p.m. to 4 p.m, and on Saturday 12th November from 10 a.m. The Sacrament of Holy communion will be celebrated next Sunday, 30th October. There will be a Special Offering for KART (Kirkcaldy Area Reachout Trust) at the service. KART is led by Chris Beattie who is doing excellent work locally with young people in schools, churches and holiday clubs, and has organised some excellent Away Weekends for the young people. This is an opportunity for Bennochy Church to give monetary support to KART to continue the excellent work done by Chris and his Team. Our support will be very much appreciated. There will be a Fairtrade Stall in the Methven Hall on Sunday 30th October where you will have the opportunity to purchase Fairtrade goods. Please also look out for the Fairtrade logo in your local shops and supermarkets. The joint Alpha Omega course with St. Bryce Kirk beings on Tuesday 25th October and runs for 8 weeks. It follows the Alpha course format and the course is free. Leaflets and booking forms are available from the minister. Please bring your filled Christmas Shoe Boxes to Church on Sunday, 6th November as they are being uplifted on Thursday 10th November. Please contact Angela Stewart if you would like a box or are unable to deliver your box by these dates. To mark the 400th anniversary of the King James bible, The People's Bible project will be coming to Kirkcaldy on the 21st and 22nd October in the Mercat Shopping Centre from 9.30am - 5.30pm. People will have the opportunity to digitally hand write two verses of the bible. For more details please contact the Minister. The October newsletter has been distributed to congregation members and is also available on the Newsletters page. The Walkers next walk is on Saturday 8th October leaving from Kirkcaldy railway station by train at 12 noon to North Queensferry (arrive 12:25). The walk is longer than normal, at 8.2 miles, along the coast from North Queensferry to Aberdour. Those with travel passes need to pay £2 for the part of their journey between Inverkeithing and North Queensferry. Those without a pass need to buy a return ticket, £6.50. If you think that this walk will be a bit too long, you can start at Inverkeithing with Dianne a little later which will take 2.5 miles off, and meet up with the others at the first coffee stop. Rona will lead this walk. All are welcome. From 11th-19th November Bennochy Church will be presenting an Arts Festival. The Festival, which was previously presented in 2009 in St Andrew’s Church, is a lot of fun but can also be hard work. To help with this we are looking for a group of people who would be willing to lend a hand for the run up to, as well as the festival itself. All that’s needed is an interest in helping put on the best show possible in the Church. If this is something you’d be interested in then please see Diane White after the service. Although we are several months away from Christmas it is perhaps time to think of our shoe box appeal as part of the Blythswood Care Shoe Box Appeal. By filling a shoe box for a child or an adult, you can bring hope and a smile to some of the world’s poorest people. Covered shoe boxes will be available soon with information leaflets inside the box. Please do not bring your filled box to Church until a definite date has been given (approx. end of October/beginning November). Your generosity in filling a shoe box will touch the hearts of those who have so little. Any queries to Angela Stewart. There will be a Sponsored Walk round the Beveridge Park on Sunday 25th September with all proceeds going to Christian Aid. Anyone interested in walking can get a sponsor sheet from Angela Stewart or just come along on the day and join in the fun and chat, whilst also supporting a good cause. Please meet at the main gate (lions) at 2.15 pm. You can walk as much or as little as you want. Friends and dogs are most welcome! Come along to the Methven Hall on Saturday 24th September at 7 pm as a team of four, or join others to make up a team. This is great way to meet new friends. The evening is lighthearted - no Mastermind or Eggheads required !!!! The quiz will be followed by a dessert supper. Tickets £4 for adults £2 for children. Our Harvest service this year will take place on Sunday, 18th September. We seek your help with donations of non perishable goods to be given for the work of the Salvation Army in Kirkcaldy, and monetary donations to help our Missionary partner, Jenny Featherstone, in Zambia by raising £200 for an agricultural project to help repair their local community hut and to buy garden tools. There will be retiral collections on both Sunday 18th and Sunday 25th September. Anyone wishing to help with the decoration of the Church for Harvest will be most welcome. Please come along on Friday 16th September at 2 pm. The annual Get-Together Tea Afternoon will be held on Thursday 15th September. This years charity is Autism with a £1 minimum donation. All welcome. Bennochy Church is once again participating in Doors Open Day on Sunday 11th September from 2pm to 5pm. On the day the Church and halls will be open and, amongst other things, there will be a display of photos and memorabilia relating to the two former congregations. Refreshments also available. The aim of Doors Open Day is to promote our local heritage by enabling locals and visitors to explore through doors not normally open to the public, for free. Boys' Brigade enrolment for 2011/12 is on Thursday 1st September – Anchor Boys (5-8 yrs) and Junior Section (8-11 yrs) - 6.30 -7.30 p.m.; Company and Senior Section (11-18 yrs) – 7.30-9.30 p.m. All boys welcome. Our first breakfast will be served on Saturday 3rd September at 8.30am in the St Andrew’s Hall followed by discussion time in the Elgin Room until 10.00am. You are invited to bring along a topic you would wish to explore with Christian friends. The Sunday School resumes on 4th September when all new and existing children will be welcomed. The new season of meetings at Bennochy Church of Scotland Guild are now available. The first meeting starts on Tuesday 4th October at 2pm and will include Rev. Robin McAlpine. New members are always welcome with meetings held fortnightly on Tuesday afternoons and Monday evenings. The climax of the Strawberry Tea season is on Saturday 20th August from 2pm to 4pm in the Church gardens. The Strawberry Fayre will include a baking stall with strawberry jam for sale. Also featuring the usual delicious sponges, flans, pavlovas, ice cream sundaes and scones. Although sun is expected, we'll be in the Methven Hall if wet! The Walkers next walk is on 21st August leaving via car-share at 12.30pm. The route is via Letham Glen, Blacketyside, Silverburn - an easy 4 mile circular, so if you haven't walked with the group before, this is a good place to start. We're hoping to have a picnic in the glen if the weather is favourable. All are welcome. The Walkers next walk is on 31st July leaving via car-share at 1pm. This is a circular around Auchtertool of about 4.5 miles. There are one or two inclines on this walk so you might want to take your poles to help you along. Coffee and scones at the Teal ( aka Kiwi) Tavern to finish. The Special Collection for CLIC Sargent for Children with Cancer raised £240. Thanks to all who supported this charity for bringing hope to many young people. The recent concert by the Forth Valley Chorus raised £1,273 on behalf of the Kirkcaldy Branch of the RNLI. The committee of the Kirkcaldy Branch of the RNLI expressed their thanks for the response to the concert and at the facilities provided by the Church. The Manse will be open to visitors to view the recent refurbishment on Saturday 18th June from 10am to noon and from 2pm to 4pm. The June newsletter has been distributed to congregation members and is also available on the Newsletters page. Many thanks to all those who helped and to all those who support Christian Aid in any way. Christian Aid and its partners are working to bring an end of poverty around the world. Although the totals are slightly down on last year probably due to the current economic situation, this is still a good result. Feedback from the collectors appears to be that people can now only give less or nothing at all in some areas of the parish. to be arranged, with all proceeds going to Christian Aid. All the Church halls have now been given new names to reflect the history and location of Bennochy Parish Church. The small hall has been named The St. Andrew's Hall, the new hall is now The Elgin Hall with the kids room now being known as The Meldrum Room. Along with The Methven Hall, all our halls are now named. In association with the new names, a floor plan is now available. The Walkers next walk is on 29th May leaving via car-share at 12.30pm. This walk is around Torryburn visiting a beautiful garden displaying various species of flowers from the southern hemisphere. This is a 3.5 mile walk with only a slight gradient so suitable for all. Fabby scones to be had at Culross Palace tearoom afterwards. Please inform Mary Stark if you intend to take part. The Committee of the Kirkcaldy Branch of the RNLI is hosting a concert in the Church by The Forth Valley Chorus on Saturday 4th June at 7.30pm. The Forth Valley Chorus is a group of over 90 women, of all ages and backgrounds, who enjoy performing a cappella music, barber shop style. Based in Edinburgh, they perform at a wide range of public and private venues. Tickets are now available from Senga Booth. Jenny Featherstone reports that the football team in Kitwe, which we supported last year, is now kitted out with boots and has two new footballs to boot! Further news when she next sees Francis, the coach, and the Racecourse team. She is also "thinking through" projects where we could help in fundraising. A major event is taking place in Princes Street Gardens on the Sunday of the General Assembly, the 22nd May from 1pm to 6pm. It is an afternoon of Celebration, Inspiration and Discovery for the whole Church family. Three separate stages and the main avenue running east-west in Princes Street Gardens will host an exciting variety of music, drama, recitals, comedy, stories, puppets, interviews, participative workshops, choirs, contemporary bands, clowns, buskers - all celebrating the Christian message and exhibiting the wide range of the Church's work. Entry to the event is completely free. Various Churches in Kirkcaldy are planning to attend and, if there is enough interest, we hope to arrange for people to travel together, either on the train or on the bus from Ferry Toll. Further details on the event can be found by clicking here. If you are interested in attending, please contact George Drummond by 15th May and remember to bring along a stone and some plastic bottles! There will be a Christian Aid Book Sale at St. Andrew's and St. George's West Church on Saturday 14th May and between Monday 16th to Friday 20th May. The Presbytery of Kirkcaldy is holding a 'Readathon' to celebrate 400 years of the King James Bible on Saturday 11th June between 9am and noon. We are looking for volunteers to read part of the bible so that the whole bible is read in three hours! If you are interested, please let George Drummond or Robin McAlpine know. Each congregation will perform the readings in their own building or even in their own home! The next issue of the Newsletter, the last till after the summer, will be available at the beginning of June. Please submit any articles by the end of May. Christian Aid Week runs during 15th - 21st May this year. There will be a 'Soup and Sweet' lunch after the service on Sunday 15th May with proceeds going to Christian Aid. Tickets, priced £3.50, will be available soon. Due to holidays and illness, there appears to be a shortage of collectors this year. If you have a spare hour or two during Christian Aid Week, please speak to Angela Stewart or Charlie Low who would be delighted to have your help. The Order of Service will be available a few days prior to each forthcoming service. This allows the hymns, readings and intimations to be viewed before the Sunday service. The leaflet can be downloaded from the Worship Events page. Rev. Robin McAlpine will be producing notes related to each sermon. These will be available a few days after each service and can be found on the Sermon Notes page. The April newsletter has been distributed to congregation members and is also available on the Newsletters page. The Scouts are having a Ceilidh in Abbotshall Church Hall on Saturday 21st May from 7.30 to 11.30pm with Bert Pozzi's Band. There will also be a buffet and wine bar. Tickets, price £10, children £5 are available from Eric Evans on 262506. All welcome. The Women's Group are holding a Table Top Sale from 10am to noon on Saturday 16th April. The sale is open to any group, organisation or individual willing to rent a table at £6 each. Only the table rents collected will go to the Women's Group funds. Any money received from the sale of goods will be kept by whoever has rented the table. This is an ideal way to make money for your group or organisation. Contact Irene Wood (267995) for further details - No jumble please! The Walkers next walk is on 10th April leaving the church around 12.45 as usual. This is a lovely country walk and the views over the Howe of Fife are spectacular. The first half is on an incline, though not really too strenuous, but we do have to walk over various types of terrain (and through a ploughed field for example) so stout footwear is advised. There is no half way stop on this 5.5 mile walk so we'll be ready for refreshments at Muddy Boots at the finish. All are welcome. The Souper Sunday lunch in aid of the HIV/AIDS project raised £307.78. Many thanks to all who attended, donated and helped at the lunch. The Taekwondo Club is holding a Family Fun Day on Saturday 9th April to raise funds to help their students attend the European Summer Camp in Rotterdam in August. Please come along if you can to join in the fun. There will be Cake & Candy, Face painting, a raffle and much more. The March newsletter has been distributed to congregation members and is also available on the Newsletters page. The excellent sum of £1,174 was raised on the RNLI Fundraising Day and has been handed over to the Kirkcaldy Branch of the RNLI. The amount raised will greatly assist the RNLI with the great job the volunteer crews so willingly do around the coasts of Britain. The Walkers next walk is on 13th March leaving the church around 12.45 as usual. We'll park up at the Lomond Centre, Woodside and do a circular walk via Markinch stopping at the Laurel Bank for refreshments. Probably only about 3.5 miles so if you haven't walked with us before, this is a good place to start. All are welcome. There will be a Soup Lunch on Sunday 13th March in the Methven Hall after the service will all proceeds going to the HIV/AIDS project. Tickets priced £3 are available now. The Kevock Choir will be performing a concert in the Church on Saturday 26th March at 7.30pm. 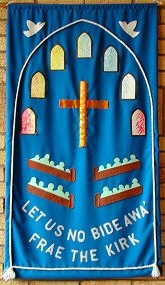 The choir is drawn from all over the Lothian area, and has performed before in the Church. Tickets costing £7.50 are on sale from Brian Booth on (01592) 890972. This concet will be similar to that being performed next month in the Queen's Hall, Edinburgh. It will soon be Lent and Rev McAlpine plans to hold a Lent study group over this period for 5 weeks. Even if you are unable to commit to all the dates, please attend as you are able. The group will meet in the Prayer room, starting at 7pm on Thursday 10th March and meeting every Thursday till 7th April. Each meeting will last between 60-90 minutes. If you are interested please speak to the minister as there are study guides for the course. Rev. Robin McApline will be in the vestry on Wednesdays from 7-8 pm for people to speak to him about any pastoral issues including the arrangement of weddings and baptisms. Please check the weekly intimation sheets for any changes. This year, the World Day of Prayer will be held on Friday 4th March with the theme of "How many loaves have you?". On this special day, more than 3 million people worldwide will be worshipping using a common prayer service booklet. Like a Mexican wave of prayer, the first service will begin at sunrise in Tonga, and move around the world until the sun sets in neighbouring Western Samoa. By then the Day will have been celebrated in more than 170 countries. Each year the service is prepared by a different country. The Christian women of Chile, South America, have prepared the service for March 2011. Please come and join us at one of these services. Fairtrade Fortnight will be held from Monday 28th February to Sunday 13th March this year. Fairtrade has become a widely recognised household name and by purchasing Fairtrade goods ordinary people can create change and turn ambitions about making trade fairer into a living reality for people in the developing world. There will be a Fairtrade Stall in the Methven Hall on Sunday 6th March where you will have the opportunity to purchase Fairtrade goods. Please also look out for the Fairtrade logo in your local shops and supermarkets. The Get-Together Christmas Party, postponed from December, will now take place on Thursday 10th March from 2pm to 4pm. Please contact Helen Lundie for further information. The total received for the 2010 gift boxes was £468.78 and the total for January was £78.89. Please keep saving your small change and make pennies turn into pounds to help our Church funds. The yellow gift boxes are available in the Church vestibule so please uplift one if you haven't already done so. Thank you to all who continue to fill the boxes. The Walkers next walk is on 20th February leaving the church around 12.45 as usual. This walk takes us on a Snowdrop Trail in Valleyfield woods. There is a fair wee incline to start, then a good mile on country road before we reach the woods. It's all downhill from there! Waterproof footwear is recommended. Refreshments for a small donation at the Riding for Disabled Centre nearby. All are welcome. Our annual Tea Afternoon serving "Sponges Or Scones" will be held in the Methven Hall from 2pm to 4pm on Friday 25th February in support of the Royal National Lifeboat Institution SOS Day. There will also be a Cake and Candy stall. Tickets are on sale now from Senga or pay at the door. All proceeds from this event go to the Kirkcaldy branch of the RNLI. The Induction of our new minister, Rev. Robin McAlpine, will be on Thursday 3rd February at 7pm, followed by a Welcome Social and Refreshments. All are encouraged to attend. The Walkers next walk is on 30th January leaving the church around 12.45 as usual and travelling to Glenrothes in cars. We'll park at St Columba's Church car park and do a circular route through Riverside Park, to Balgeddie House for coffee and scones and return via Leslie house - approx 4.5 miles. All welcome. The next event will be an induction service on Thursday 3rd February assuming Presbytery approval. Details of the opportunities to sign The Call are listed in the previous news item, below. Please note that due to uncertain weather conditions, the Not Strictly Burns Supper being held by the Women's Group on Saturday 22nd January has been cancelled. On Sunday 16th January, at 11am, Rev Robin J. McAlpine BDS BD will be conducting worship as sole nominee for the position of minister for Bennochy Parish Church. Immediately thereafter the congregation will have the opportunity to vote For or Against the appointment using voting papers. All persons on the Electoral Register are invited to attend this service and participate in the vote. The result of the vote will be announced as soon as counted and members are encouraged to stay behind for tea or coffee while this is being done. Sunday 16th for one hour following the announcement of the result of the vote. Daily from Monday 24th to Friday 28th from 7pm until 8pm. Sunday 30th from 10am until 11am and from 12 noon until 1pm. Monday 31st from 6pm until 7pm. We wish to encourage as many people as possible to sign The Call to show their support to the new minister. Those whose names are on the Electoral Register may sign The Call in person or by means of mandate. Forms for this may be obtained from the Session Clerk or please contact your Elder. If your name is not on the Register but you are a regular worshipper in this congregation you will have the opportunity to sign a Paper of Concurrence at the times listed above. The Women's Group is hosting a Not Strictly Burns Supper fundraising evening on Saturday 22nd January from 7 to 9.30pm in the Methven Hall. Come and enjoy an evening of Scottish delights, music and song. Tickets, adults £8, children £4 are available from group members.